Private Troubles or Public Issues? This book bears testimony to the value of a progressive form of academisation of social work education in most European countries, including former communist countries which had to re-establish social work education. It also manifests the confidence of contributors in belonging to a serious academic discipline, and the fruitfulness of bringing research ‘home’ from neighbouring disciplines such as sociology, psychology, social policy, or pedagogy into the mainstream of social work. The contributions to this book converge on a small number of core issues for contemporary social work. These are methodologically the conceptualisation of different and interacting dimensions of diversity, and practically the defence of professionalism and discretion against encroachment by neo-liberal ideologies and cost-cutting regulations. In so doing, this underscores that theory matters in social work. Authentic social work research can demonstrate that social work practice has no reason to shy away from basing itself on evidence and being professionally accountable as long as its notion of evidence recognises and does justice to the complexity of social problems and acknowledges the value of inter-subjectivity in producing useable and ethically grounded evidence. 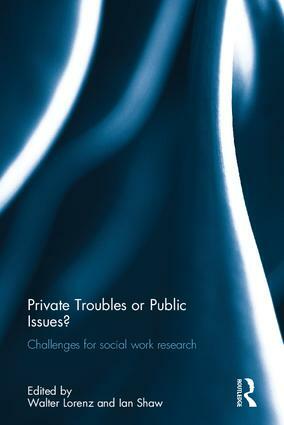 This book was originally published as a special issue of the European Journal of Social Work. Walter Lorenz is Professor of Social Work at the Free University of Bozen/Bolzano, Italy, and was previously Jean Monet Professor at University College, Cork, Republic of Ireland. His research focuses on the interface between social policy and social work practice in different European contexts. Ian Shaw is Professor Emeritus at the University of York, UK. He was the inaugural chair of the European Social Work Research Association, and his most recent book is Social Work Science.